Team Smith: I Love Santa! 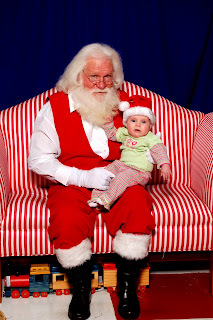 Joe took Sierra to sit on Santa's lap last week. Yes I am a bad mother, I couldn't go because I was working but my fabulous husband was a champ and got it done. She is so cute I could just Eat her UP! This is the REAL Santa too! 25 years at North Dekalb Mall. He's the real deal. Joe used to get his picture taken with this Santa. So precious that he's still there to get a pic with Sierra.